Thus far in my thesis journey I have identified my research question, approach and a plan. My approach is to learn from past history, through interviews and surveys with eminent designers, and to utilize current communication tools in order to effectively impact future generations. 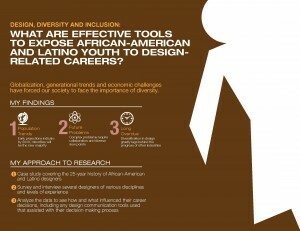 My research question ask what are effective tools to expose African-American and Latino youth to design-related careers. I plan to electronically survey 25 to 50 designers and then administer in-depth interviews with 10 eminent designers. Next I will analyze the data to see how and what influenced their career decisions, including any design communication tools used that assisted with their decision making process. 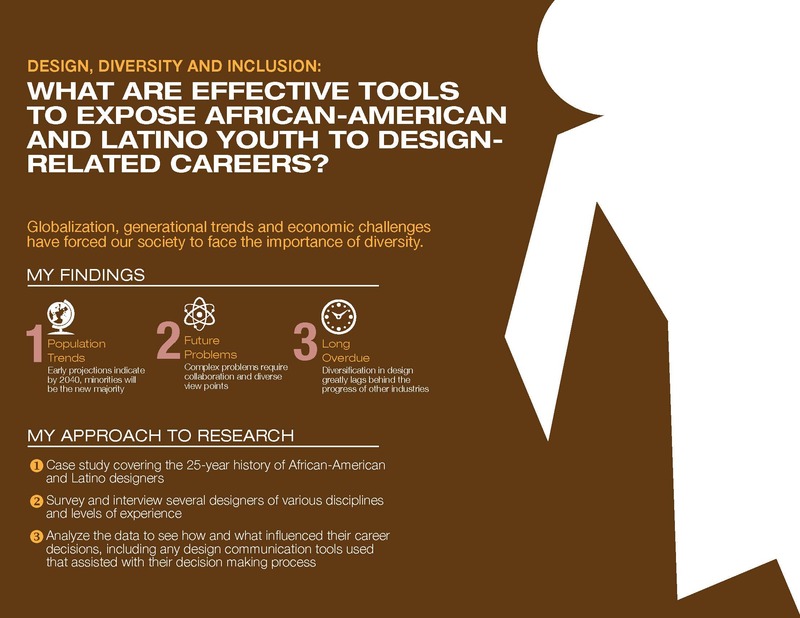 My intention for the outcome of this study is to create a series of communication tools about design for underrepresented populations in this field, specifically African-American and Latino communities. Further usability of this series of tools will be explored through the use of a portal to store these communication tools for students, parents, educators and other practitioners as a resource to gain information about design-related careers. For my thesis, I will be developing a series of diagrams to visually display several of the terms and policies referenced in my research. The first -shown below- is my visual representation of the “Design Journey” also called the “Design Pipeline.” This pipeline represents the journey a designer takes in their career. It shows color coded rounded sections, marked with educational/career stages and gray vertical bars to show decision-making stops or “leaks” in the pipeline while a designer is on their journey. I am in the development process with this graphic, as with the rest of my research, thus it is subject to change. This blog is really proving to be an interesting tool for summarizing and promoting your thesis work as it evolves. So far, it looks great! You mention in your first sentence here that you have identified your research question and I’m just wondering if you might post it and ruminate a little about the connection between it and the approach you’ve chosen to take. I think it would be interesting to see more clearly how you’re making that connection.